Ever since I was little, way back in the day, I’ve always been told I was quiet. It was usually said as a passing observation, but, as I got older, it started to sound more like a character flaw. Especially when tagged with other ‘observations’ like, “You don’t say much, do you?” It would annoy the pants off me (not literally!) when some people would act shocked if and when I did say anything. I didn’t like being the centre of attention growing up, and I still don’t. I’m always happy to stay in the background, even at family gatherings. Being Asian, ‘large extended family’ comes with the territory. ‘Shy’ was added to the label of ‘quiet’ and I rolled with it. I was awkward in company and loved being alone, much to my sister’s disgust. Two years older than me, we spent a lot of time together growing up, along with a couple of our cousins, all close in age. They’re outgoing and gregarious… I’m the Scorpio who’d rather ‘hide’ and observe from the shadows. It’s only in the last couple of years that I’ve realised I’m an introvert. And so many things now make sense. The type of introvert I am – INFJ – means, while I love my ‘alone-time’, I also enjoy being with people. But only certain people. And for only a certain amount of time. When I’m comfortable with people, I open up and enjoy having a good laugh. What I enjoy most is having in-depth conversations. I’m a fantastic listener, but I prefer talking to people face-to-face. Here’s a little secret – I’ve been known not to answer the phone when it rings. I’d rather know who it is so I can prepare myself. These days, I don’t answer the landline at all because of the number of ‘cold calls’ coming through. The way I see it, if it’s important, the caller with either leave a message or send me a text. And it freaks me out when people visit unannounced. I need to prepare! Not that long ago, I’d push my feelings aside and pretend none of this stuff bothered me. But, post-divorce, post-other stuff, and in my mid-50s, I don’t feel bad about it. Not all the time anyway. 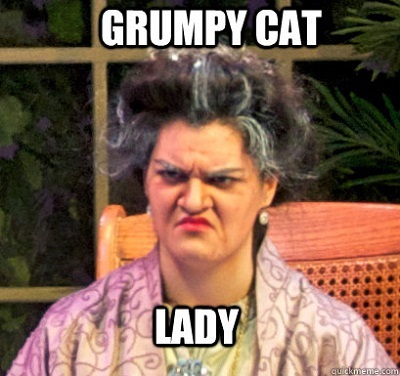 I see it as practice for being a grumpy old woman. With cats. What about you? Were you stuck with a ‘label’ growing up? Made to feel bad for being quiet or being loud? Did it bother you?